Apart from their similarities, the cello sonatas of Rachmaninoff and Shostakovich are stylistically opposed. 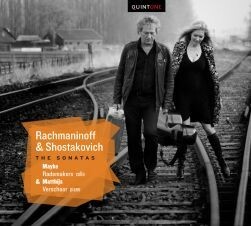 Where Rachmaninoff was strongly embedded in the romantic tradition of the 19th century, Shostakovich expressed himself in a modernistic, neo-classical style, with edgy dissonants and contrasts. Nevertheless, Rachmaninoff ‘s full blooded romantic sonata couples exquisitely with the more graphic and sometimes cynical musical language of Shostakovich. The sonatas for cello & piano by Rachmaninoff and Shostakovich belong to the most important works of the 20th century written for this instrumental combination. Regarding virtuosity and lyricism, both sonatas demand the utmost of both the cellist and the pianist. Each work is made up of four movements with respectively similar tempo indications. The slow movements appear to reveal themselves as the soul of the works. The cello-piano duo Mayke Rademakers and Matthijs Verschoor form a very inspiring musical couple. Their previous recordings with works by Bosmans and Bridge were highly acclaimed by the international press: They perform with unstinting dedication, passionate and urgently expressive..